Signorile wins the all-around (37.05) at state qualifier at Oceanside, and Roslyn freshman Sirota placed second. Syosset freshman Jacobs also qualified. 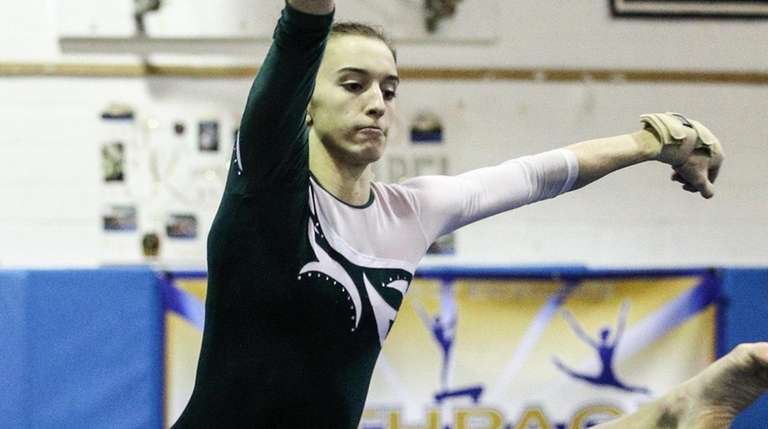 Round-by-round scores meant nothing Wednesday night at the Nassau gymnastics state qualifying meet at Oceanside. They couldn’t predict a clear leader of the Nassau state team until the very end. Once all the decimals were added up, Joanna Signorile from Carle Place / Wheatley emerged victorious. She won the all-around with a score of 37.05 to secure her ticket to states. Signorile placed third on the uneven bars (9.050), second on beam (9.175) and first on vault with a 9.6 after performing a Yurchenko layout one time. That was her highest score in the event this season and a high for the county this season. Signorile’s been in this position before. She’s competed for the Nassau team three years in a row as an All-Arounder. Last year she placed second at the qualifiers. Second place this year belonged to Shani Sirota, a freshman from Roslyn. She scored a 36.575 in the all-around. She placed second on bars (9.1), vault (9.55) and was third on beam with a 9.125. Sirota is a first-time member of the state team but that isn’t hindering her confidence. She came into the meet knowing her level 10 gymnastics skills would give her a chance to finish at, or near, the top. The third member of the all-around team is Allie Jacobs, a freshman from Syosset. She tied for third (34.9), but because her average throughout the season was higher, she secured the final all-around spot. All three girls will represent Nassau during the state championship March 2 at Cold Spring Harbor. Neither of them seemed stressed. They all agreed they’d practice in the weeks to come but most of all have fun. “Our main goal before states will be to support each other and just have fun,” Sirota said.